This condo is privately managed by the owners, Lynne Charles and Steve Metcalf. BEAUTIFUL, TRANQUIL, A REAL RETREAT. This condo is on the 18th floor and has floor to ceiling windows/doors with dramatic city/ Rocky Mountain views. The design style is 'Dwell Modern,' with fun paint colors and whimsical modern touches, such as the bedroom wallpaper Leaf motif, the 'bubble' pattern plates and original photographic artwork. A special touch is the authentic Shoji sliding doors, which separate the bedroom from the living room when you want privacy. Enjoy 800 square feet of space--twice more space than you would at a hotel, with more amenities and a very competitive price. And the views...You can see the Denver Center for the Performing Arts on the next block, with views Long's Peak in the distance-- all from your own private balcony! IDEAL LOCATION: Walk out of this retreat, take the elevator down, step through the lobby and you are THERE, we mean truely DOWNTOWN! The Performing Arts Center is just a half block away. The Convention Center is just two blocks away as is historic Larimer Square, with all of its restaurants, cafes, bars, happenings-- and the ever popular 'MARKET'- a deli/coffee shop that is a Denver institution. On the corner is Sam's Diner, open early and late which offers up a true slice of city life and great people watching. Everything else is an easy walk, including the Pepsi Center, Platte Valley, Union Station, the Denver Art Museum, the Clifford Stills Museum, Coors Field baseball stadium. Confluence Park (REI, river walk and kayaking), as well as the beloved Tattered Cover bookstore and many other sporting and cultural attractions. This is a completely renovated 800 square foot condo with an open floor plan that can be closed off by floor-to-ceiling Shoji screens for privacy. It features a full master bedroom with walk-in closet, combined living/dining area open to the kitchen, which is partitioned off by an island with quartz slab counter. The bathroom is spacious and sleek with a large glass-enclosed shower. In the entry hall a small office nook is complete with desk and accessories for business. No expense has been spared with this 'Dwell Modern' condo. It is a beautiful, calming, tranquil retreat that will allow you to relax and unwind in between your Downtown Denver activities. The rate includes all utilities, wifi, tv and furnishings. Also, the HOA does not allow us to rent to more than two guests, and this includes children. The occupancy policy is strictly enforced. Cleaning fee of $100 upon departure. For stays a week and under, the cleaning fee is $85. Secure covered parking is provided across the street, with a parking pass which enables you to come and go. We have lived in the Denver area for many years and share a love of architecture, travel and art. Our past includes Steve’s work at the Denver Convention and Visitor’s Bureau, many years in the non-profit world for both of us, and a 1 ½ year stint in Mexico promoting tourism to Colorado. Our passion for travel is the primary reason we decided to enter the vacation rental business. This condo represents a labor of love for us. For many years, we have bought and renovated historic homes in Denver, from an 1890’s Victorian cottage we bought in 1991, to our current Arts & Crafts home about five miles east of Downtown. Victorians are fun, but you can only lose so many brain cells stripping paint. 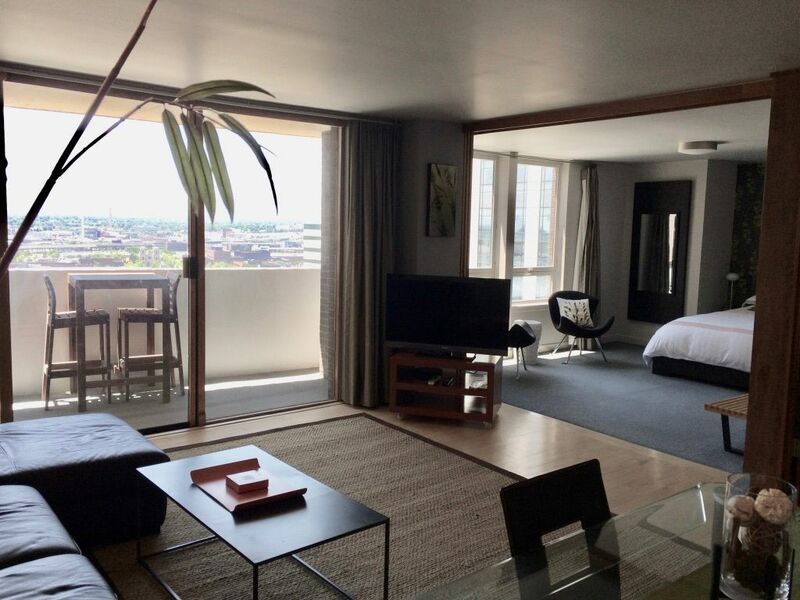 Our desire to have a place Downtown Denver led to our decision to buy this condo. Much of the inspiration for the design came from Dwell magazine, with its focus on modern and green design—the bold colors, the simplicity, the geometric shapes. The leaf motif reflects both our love of gardening and this amazing natural world. We often try to meet our guests, and will be happy to give you a tour of the property upon arrival and make additional suggestions on great ways to spend your time in Denver. Please feel free to call us at one of our numbers if there is anything we can do to make your stay more comfortable. We bought our condo because of its ideal location in Denver's Theatre District, and close proximity to all of the Downtown attractions. We love the Denver Center for the Performing Arts, and often attend plays and the symphony. (Denver has the second largest performing arts center in the country!) In this location, you can take the elevator down to the lobby and be in our thriving downtown area upon walking out of the lobby doors. We also chose our condo because it is high enough up to provide an outstanding view of the Rocky Mountains, which can be enjoyed from the private balcony. We love sitting there and enjoying a glass of wine or coffee. Coin-operated washing machine and dryer in the large 3rd floor laundry room, seconds away by elevator. Covered, secure parking is available for an additional $200 per month. There is a fitness center, outdoor rooftop pool (open from May to September, weather permitting), and billiard room on the third floor. Salt and pepper, spices and some condiments left by other travellers. Fun bubble pattern plates. Everything that we could think of that a guest would need. We provide settings for up to six people, since we do not want any parties larger than six. Fully furnished with the tools and dishware you need for cooking and serving. A dining table is provided, as well as seating at the kitchen counter. On a roller that guests can turn to watch from the living room or from their bed. There is a billiard room on the third floor. I enjoyed a wonderful stay at the Leaf Suite while in Denver for a conference. The location was incredible, just right around the corner from the convention center, and just off the 16th St. Mall. The condo is nicely appointed and very well-maintained. The owners met me at check-in and were quite helpful with advice on where to shop and eat within walking distance (I did not have a car). Easy bus ride from the airport to 16th St. A great experience. This place was like home for me. I was attending a convention nearby at the Sheraton and was so happy I didn't stay in a hotel. This was centrally located and had the most comfy bed ever!!!! I travel for a living and the leaf suite made me feel so comfortable that I could have stayed for weeks! The view is stellar and the kitchen is perfectly appointed. I will be back! Wonderful condo in a great location. We loved this condo -- it had a fantastic view of the mountains, it was beautifully decorated (LOVE the slate countertops in the kitchen) and very comfortable. Plus, the location was perfect -- just one block from the 16th Street mall, we were able to walk to Coors Field and to many wonderful restaurants. Parking was easy -- just a block away. We would definitely stay here again, and we highly recommend this place! Located in the Theatre District, a half block from the Denver Center for the Performing Arts. Many restaurants and shops are within two blocks. The Colorado Convention Center is a 1 1/2 blocks away, and the 16th Street Mall is just a block. This is an ideal location for the urban visitor who does not want to get in the car to visit major attractions. PLEASE NOTE: Rates are based upon duration of stay. Best rates are for a minimum 60-day stay. Please contact owners for specific rates for your time period. Stays under 30 days may be subject to Denver's lodging tax at an additional charge to guests (same as hotel tax).